Mangaluru, Feb 10,2017: Reports focus on education hubs in Karnataka with increasing number of drug trafficking cases, with the maximum number pertaining to sale of illegal drugs, in 2016. The number of cases registered in Mangaluru was 239, way higher than Bengaluru at 128. Home Minister G. Parameshwara told the Legislative Council that several cases had been booked in educational hubs. “We will also intensify awareness in these areas,” he said. According to data furnished in the House by the Home Minister on the number of cases registered division-wise and number of persons arrested in the last three months (from Nov. 2016 to January 2017), more cases were registered in Mangaluru city in comparison to Bengaluru. While 67 cases were booked in Mangaluru and 79 people were arrested in the last three months, 49 cases have been registered in Bengaluru and 93 persons have been arrested, according to the data. In both Belagavi and Mysuru, three cases had been booked and five persons arrested in each of the places. In Udupi, 26 cases had been booked, the Minister said, adding that a special drive will be taken to tackle this menace. The jurisdictional Deputy Commissioners of Police (DCPs) will personally visit educational institutions and talk to students about the harmful effects of getting addicted to narcotics and psychotropic substances. Online supply : With regard to online sale of narcotics, the Minister said the cybercrime division of the police force is tackling the issue. “We are also creating a database of past offenders in drug pedalling and keeping a close watch on them,” he said. 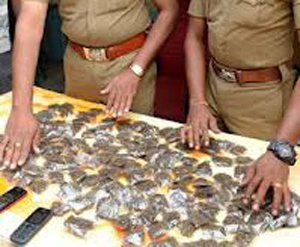 The government has also been booking repeat offenders in drug pedalling under the stringent Goonda Act and steps are being taken to provide all local police units with a drug detection kits to sniff out drugs during raids, the Minister added. The youths are the one who are addicted by the drug menace.